It may be time for a new couch, but the terrifying prospect of sofa-shopping online might leave you watching Netflix on the floor. Don't be intimidated by the wide world of internet furniture retailers — if you take the right precautions, purchasing a couch through the web can be a shockingly pleasant experience. The key is restraint. Not in size, shape or shade — feel free to go as big and as bold as you want. But purchasing furniture online can be disastrous if you let impulsiveness get the best of you. Before buying, take time to consider space, fabric and style. Make sure to think about your lifestyle, too. Don't just click "Buy." Buying a couch online can feel like a leap of faith. To soothe your worries, start with this simple step: measure. There are a number of things to consider before purchasing your new couch, but the most important consideration is how the furniture will fit in your space. You'll need to know a few different measurements: first, get the raw numbers for the length and width of the room in which your couch will reside. 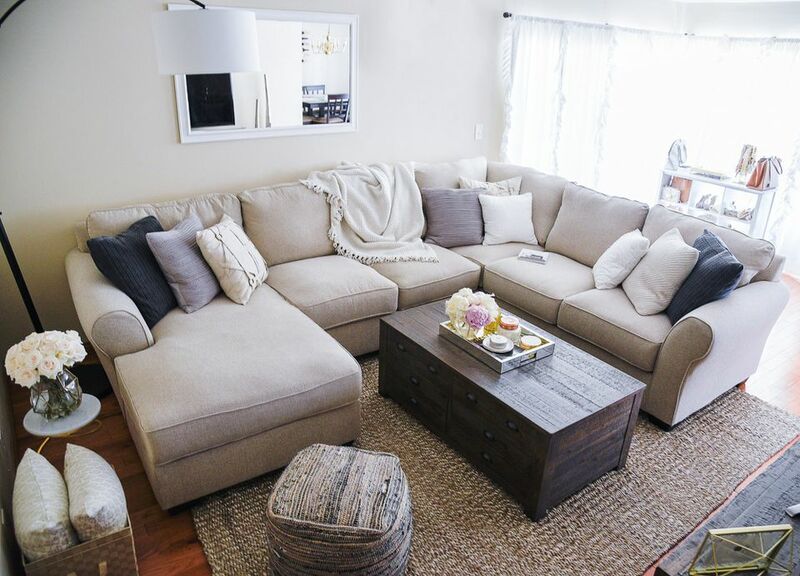 Yes, you might be able to squish an 84-inch couch into your space — but will your guests be squished, too? Ideally, there should be 36 inches between the wall and your furniture and 18 inches between your couch and the coffee table. This can also help you decide between a standard rectangular couch and a sectional. After all, nothing makes a cramped space feel tighter than an awkward sofa leg jutting across the floor. If you're outfitting a small room, consider taping off your potential couch placement to make sure your measurements feel right. Then, pick a couch height and depth that feels right for you. What feels coziest to your best friend may feel way too deep for you. The best way to determine this measurement is to curl up on couch you (or a friend or family member) already owns. Too deep? Buy something smaller. Too skinny? You'll know to buy larger. Just right? Jot down that measurement — you've found a winner. Narrowing down your couch options means making some hard decisions about upholstery. Think seriously about this couch and its intended use. Will it be a one-size-fits-all, everyone-is-welcome (including Fido!) family couch? Consider microfiber upholstery, which can handle a bit of rough-housing. Definitely don't pick silk, which will rip the second your kitten's claws come out. Or are you hoping to order a showcase piece for your formal living room? Go for silk, or pick something with a lot of texture. Consider the couch's structure, too. A traditional, wood-framed couch may be a terrible choice for a home with kids — sharp corners have caused many emergency rooms worth of boo-boos. If there are little feet playing chase around your living room, consider soft, upholstered edges. Once you've settled on a size and style, start scouring the web. Leave no website unturned. There are a number of places to buy couches online (you can even hit up stores like Amazon or Target, which have a surprising selection, if you're on a tight budget). Does the thought of trawling through so many websites stress you out? Take a deep breath and know it's all for the greater good of your home. With so many options available, spending time on your search is the best way to ensure you love the couch you choose — and prevent settling. The worst part of buying a couch online: taking a chance on your comfort. If possible, it never hurts to take a trip to the showroom for a quick lay-down on the sofa you've selected. But for most online retailers, there's no showroom. That's when reviews come in handy. Let previous buyers be your guide: did they find it too soft, too hard, or too flimsy? Pay attention to their critiques. But also pay attention to how the store responds. Flukes do happen, especially with online sales — sometimes couches come off the assembly line with a flawed coil spring or too much stuffing. Companies that respond admirably (say, by replacing the customer's couch) are likely still worthy of your time. How long is the couch under warranty? Most stores will refund a damaged product for at least a year. What are the terms of the return policy? Will signs of use — like a wine spill — negate the policy? Will the company pay for shipping? Some may cover the expense for the first few weeks, leaving the responsibility on you to cover a likely expensive shipping bill after week three. Now comes the fun part: actually holding bits and pieces of your potential new couch in your hand. Once you've narrowed down your sofa color and fabric selections. Choose a few different selections: pick a range of similar colors, or trial a shade in both microfiber and velvet. Once you have the fabric samples in-hand, don't make your decision immediately. Gut instinct may be valuable, but so is thoughtful consideration. The perfect color and fabric depends on the color of your hardwood floors, the exact shade of white you've slathered on your walls, the other furniture in your room — and even the sunlight. Pin your samples on the wall and let yourself ponder for a day or two. Just like picking paint, this process takes time. Figure out what looks best in the morning — and which colors truly shine come sunset. Before committing to your perfect couch, look for a discount. Many stores offer 10–15% off just for signing up for their email newsletter — when you're buying an expensive product like a couch, those savings can be huge. Websites like Retail Me Not give an up-to-date overview of discounts, and Honey automatically applies the best discounts to your order. No codes to be found? If your couch-buying needs aren't urgent, consider waiting for a major sale. These events are often centered around major holidays or long weekends and can dramatically decrease the price you pay. Stores frequently hold smaller sales, too: once you've got all the details picked out, consider pausing your purchase and checking the site's homepage on a daily basis. You may just find a fantastic deal. But hopefully, everything will turn out wonderfully — and any minor problems will be quickly corrected. Once your new couch is settled into its home, grab a blanket, pop some popcorn and enjoy the comfiest, coziest Netflix-and-chill experience ever.